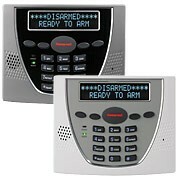 Our security system will support multiple keypads. We often suggest having one in the garage entry area and another in the Master bedroom. We have several options in which keypad we use. Visit our Interactive Demo page to see how they work. The 6150 is a “Fixed English” LCD display keypad with dedicated function keys. The 6160 is a full Alpha-numeric text display keypad. The 6150 and 6160 keypads also have a version that includes voice. The keypad will announce the system status verbally. They also include a message center so that you can leave a message for someone in your home. The 6460 is a premium full Alpha-numeric text display keypad. 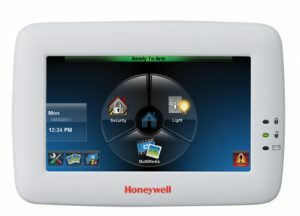 With its large, customizable color touch screen, Honeywell’s 6280 Tuxedo keypad makes it easier than ever for end-users to take advantage of their security system features. The 6280 also integrates zwave automation devices for control of lights, thermostats and garage door motors.Even the most advanced functions are simple, with graphics and menu driven prompts guiding the user every step of the way. When not in use, the keypad becomes a digital picture frame scrolling through pictures of your loved ones.